Margaret and Sylvan Adams Met With Prof. Nili Cohen, Academy President, and Current and Former Chairmen of the Academy’s Adams Fellowship Committee. 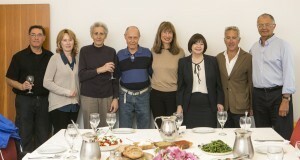 Margaret and Sylvan Adams Met With Professor Nili Cohen, Academy President, and Current and Former Chairmen of the Academy’s Adams Fellowship Committee at the Israel Academy of Science. Left to right: Prof. Moti Segev, Current Chair; Margaret Adams; Prof. Chaim Cedar, former Chair; Prof. Yoram Groner, Founding Chair; Prof. Nili Cohen, Academy President; Batsheva Shor, Fellowship Director; Sylvan Adams; Dr. Meir Zadok, Academy Director.